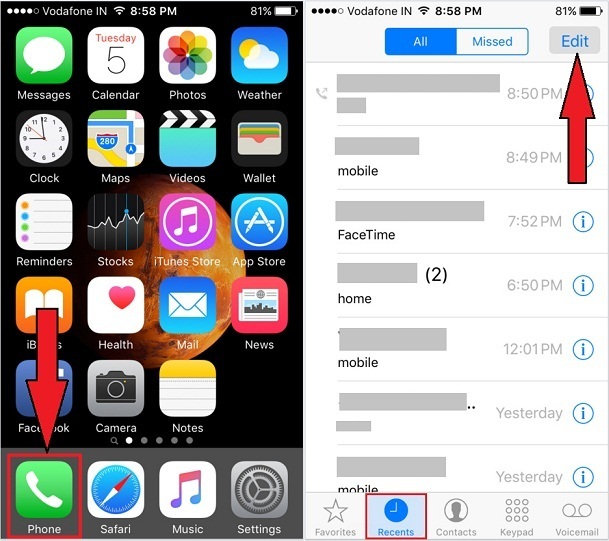 Here described way through Apple iOS users can learn to delete all recent calls history on iPhone SE, iPhone 6S and running all iOS 9 and earlier device. Generally all carriers for example Verizon, at&t, Sprint or T-Mobile and a carrier that you’re running on your iPhone. So while you make an incoming call, get outgoing call/missed calls on your cell phone then that creates a logs inside the Phone app and recent function. Luckily, The Apple gives amenities so their users can clear all recent calls logs at once as well as multiple calls. So toady, I will show you, how to clear all recent calls history on iPhone SE, iPhone 6S Plus and on all earlier model with the illustration. 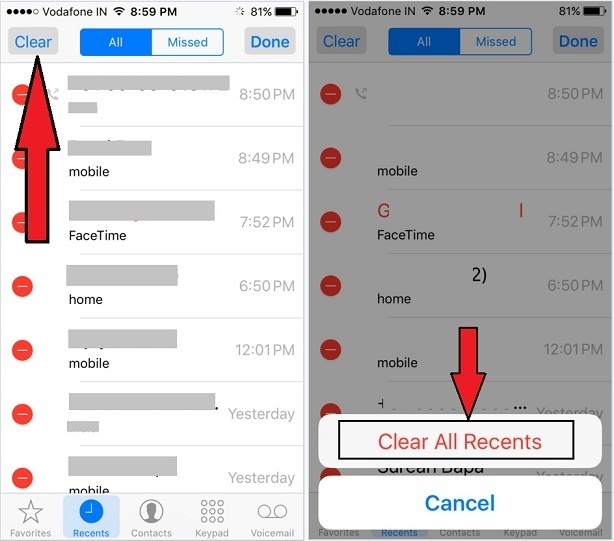 Sometimes users addressed a problem that the iPhone recent calls list won’t clear. If you’re one of them. Don’t worry. For that, following steps carefully and get your job. Step 3. Tap on Recents appears between Favorites and Contacts. Step 4. Tap on Edit appears at top right side corner. Step 6. Tap on Clear All Recents to make confirm. The call history has been cleared. Phone app> Recents > Tap and hold on a contact that you want to delete > now move left side on screen > get option Delete. That’s it. If you don’t make confirm then your entire iPhone calls history will stay as it is. After deleting all calls history, there is not an official way to get back. After tried above steps, however, your iPhone won’t allow you to delete then Restart iPhone and go back on home screen to do clear. Hope, now you got success to delete all calls and Missed calls history on your iPhone SE. Please write a caption in the comment if any issue. Share your experience in the comment box, please know us, how’s useful the way to clear or delete all recent calls history on iPhone SE, iPhone 6S.